From Baghdad to Bengal, St Paul’s Cathedral to the Imperial War Museum, the importance of Gerry Judah’s artwork should not be underestimated. Visually forceful and sensitively crafted, Judah’s poetic works engage with pressing geopolitical issues of conflict and climate change, while remaining deeply personal. Following the success of Fragile Lands last year the much acclaimed exhibition is now reinstated in an exciting new exhibition context bringing together unseen works by Judah alongside a rare collection of the artist’s three-dimensional paintings and captivating sculptural series Bengal. During his illustrious career, Judah has exhibited internationally in spaces ranging from the Saatchi Gallery to the British High Commission in Delhi. His striking Great War memorial installation is currently on display in the nave at St Paul’s Cathedral, London. ‘Ruins hide things. Not just the memory of what they were, but the memories they still contain’ (Robert Fisk on Gerry Judah, The Independent). Judah has previously worked in film, television and theatre, creating settings for the BBC, Royal Shakespeare Company, Michael Jackson and Paul McCartney amongst many others. His spatial sensibility can still be felt in the dramatic, emotive and physical scale of his recent artworks, which operate on a captivating boundary between painting, architecture and sculpture. In his recent Bengal series, Judah turns his attention to the slow devastation wrought by climate change in India, the country in which he was born and grew up. As in his earlier works, Judah’s engrossing visual spectacles encourage viewers to engage with the complex, the almost unapproachable; the histories of growth and loss, tradition and modernization that are layered in the country. 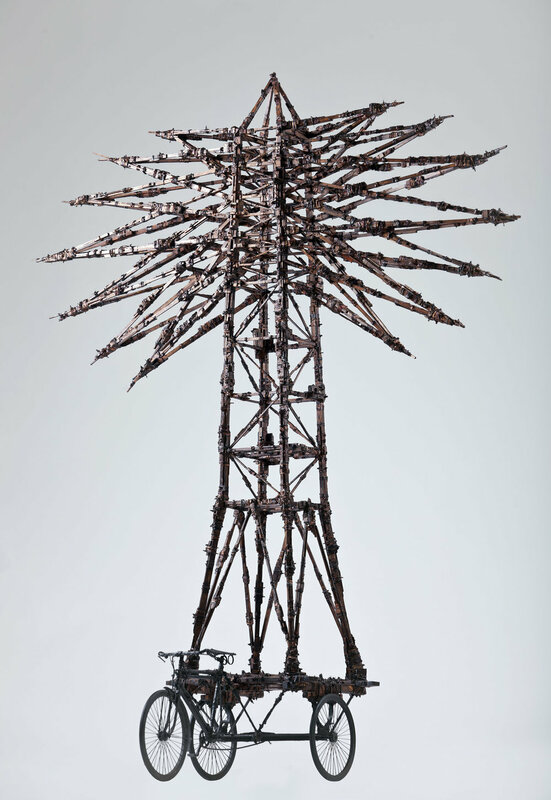 In his exquisitely detailed sculptures, the structures of temples, electricity pylons and religious artifacts are precariously balanced on rickshaws, a mode of transport that has come to symbolize India’s ingenuity and urban dynamism. Constructed in part from coal and ash, they performatively enact the environmental burden of human industry, while also representing communities’ inherently creative capacity to recycle, pull together and move forward. ‘These intricate, fragile and colourful works reflect the beauty of India amongst its degradation’ Jane Morrow, Curator Wolverhampton Art Gallery). This innovative and thought-provoking exhibition is certainly not one to miss.